A judge has accepted the landmark $765 million settlement between the NFL and the thousands of retired players suffering from the effects of long-term head trauma. NBC's Anne Thompson reports. The National Football League has agreed to pay $765 million to settle thousands of player lawsuits over head injuries — a deal that both sides declared a win for retired athletes with debilitating brain damage. The proposed agreement, which was hashed out during court-ordered mediation and announced Thursday, includes $675 million to a compensation fund, $75 million for medical exams and $10 million for a research and education fund. Former players with severe conditions like Lou Gehrig's disease would be entitled to payouts as high as $5 million. The families of players diagnosed after death with the degenerative disease chronic traumatic encephalopathy could collect up to $5 million. 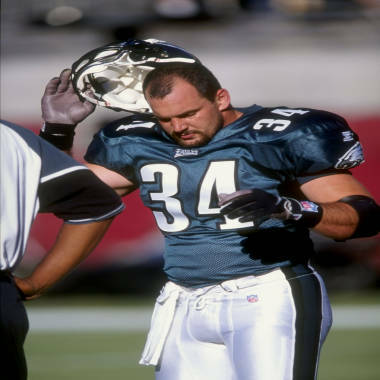 Kevin Turner, shown here while playing for the Philadelphia Eagles in 1998, is one of the lead plaintiffs in the players' lawsuits against the NFL that was settled this week. Former Philadelphia Eagles running back Kevin Turner, 44, who was diagnosed with Lou Gehrig's Disease four years ago, said the payouts "will lift a huge burden off the men who are suffering right now." That suffering was laid bare by the obvious difficulty Turner had speaking — one of the side effects of a progressive disease that eventually robs patients of the ability to stand or walk. The father of three noted that countless retirees may not have symptoms for years. "It's easy to forget just how many men have played in the NFL throughout the years," he said. "In the future they may wind up unfortunately like me, and they know that is a real probability." While the settlement stems from the cases of some 4,500 players, it will cover anyone who is retired by the time it's approved by a federal judge in the next few months. The plaintiffs included 10 members of the Pro Football Hall of Fame, along with the families of former San Diego Charger Junior Seau, ex-Atlanta Falcon Ray Easterling, and former Chicago Bear Dave Duerson, whose suicides in 2011 and 2012 brought attention to the issue. Players do not have to prove they suffered a concussion or that an on-field injury caused their brain illness to collect, and they can apply for more funds if their condition worsens over time. Junior Seau's family sued the NFL after the linebacker tested positive for a brain disease with symptoms that may include depression, aggressive behavior, and is caused by repeated hits to the head. Former NFL player Kevin Turner and widow Mary Ann Easterling explain football's potential dangers. The lawsuits accused the NFL of glorifying the violence of the sport while ignoring the health risks and failing to warn players that repeated concussions could cause brain damage or even leave them prone to depression and suicide. Plaintiffs' lawyer Christopher Seeger said he was not disappointed that the settlement means the NFL does not have to open its files, showing what it knew about the link between concussions and later illness. "We got what we wanted," he said, insisting that the deal did not leave any money on the table. "We got everything we could possibly get out of the NFL." The fund will be in effect for up to 50 years and the NFL will kick in more cash if it dips below $50 million, Seeger said. The NFL, which has denied misleading players about the dangers of the game, will not admit any wrongdoing under the agreement, which must be approved by a federal judge. The mediator, former federal judge Layn Phillips, called it a "win-win" for all involved. "The alternative was for the two sides to spend the next 10 years and millions of dollars on litigation, which would have been great for lawyers, expert witnesses, trial consultants and others," Phillips said in a statement. "But it would not do much for retired players and their families, who are in need. This resolution allows both sides to join together, do something constructive and build a better game for the future." NFL Executive Vice President Jeffrey Pash said the agreement was an effort to "do the right thing." "This is an important step that builds on the significant changes we've made in recent years to make the game safer, and we will continue our work to better the long term health and well-being of NFL players," he said in a statement. In recent years, the NFL has instituted rule changes to cut down on neck and head hits and keep players with concussions off the field. Some of the players have also sued helmet maker Riddell, but those disputes have not been settled. The NCAA, meanwhile, is still trying to negotiate a deal to settle a separate case that could involve thousands of college athletes. Chronic traumatic encephalopathy could only be found after death – until now. Researchers at Evanston's NorthShore Neurological Institute and UCLA discovered brain scans of five former NFL players who had at least one concussion on the field showed more tau protein than healthy men of the same age. NBC's Dr. Nancy Snyderman reports.